Derrick Rose was never more than an affordable experiment for the Cleveland Cavaliers. He wasn’t going to be any sort of replacement for Kyrie Irving, nor was he going to be depended upon during clutch moments in the postseason. He’s bargain depth, nothing more, nothing less. Obviously, this sounds pretty harsh, especially considering Rose is still on the Cavs’ roster. However, based on the fallout from his recent hiatus, the aforementioned points need to be reiterated. As it stands, they’ll likely help explain why Rose ends up departing from Cleveland before this season comes to an end. Rose is still rehabbing an ankle injury, and has been off the court since November 7. However, even if he was healthy, it’s tough to believe Cleveland would be giving him any playing time yet. Thanks to Rose’s abrupt departure from the team this past Thanksgiving, the Cavs in general are having a lot of trouble trusting him. Sure, he notified everyone in Cleveland before stepping away to debate retirement. This situation was handled much better than last year’s instance, when he completely disappeared on the New York Knicks before a game without notice. 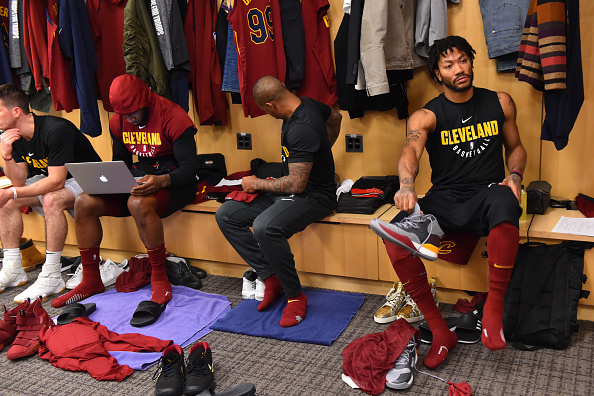 Still, in Rose the Cavs players have a teammate who felt it necessary to take an early season leave of absence in order to figure out if he wanted to keep playing basketball anymore. As a result, it’s difficult to believe he’s in good standing within the locker room even after he apologized to his teammates. Not helping matters is the fact the team has thrived in his absence. After a lackluster start to the season, the Cavs are on a tear, winning 15 of their last 16 games. They’re firing on all cylinders offensively, while the lackadaisical defensive effort shown in the early days of the season has vanished for the most part. The man replacing Rose in the lineup, veteran Jose Calderon, has kept the offense humming along despite not contributing a ton on the scoreboard. This isn’t to say Cleveland is thriving because Rose is out of the picture. It is, however, more food for thought when the team eventually decides what to do with its mercurial point guard. So far this year, Rose been inconsistent offensively and a turnstile defensively. His trademark inability to stay healthy popped up in the second game of the season. To top it off, he completely alienated his teammates within the first month of his time in Cleveland. Making things worse is the fact Rose is only playing on a one-year, $2.1 million contract. The Cavs hardly made a significant investment in him, meaning the reasoning for keeping him around is minimal at best. Again, this shouldn’t be read as any sort of slight against Rose as a person. I have no doubt the injuries he’s endured over his career have taken a toll on him mentally, and wouldn’t blame him if he decided to hang ’em up as a result. However, the Cavs also have judge him based on what he’s contributing on the court. To date, it’s been very little, and the team seems to be surviving just fine without him. At this point, re-shuffling the deck and giving extra attention to a player who not only isn’t costing the team much, but also already implied he’s not too invested in the season in general just doesn’t make sense. Because of this, I would bet Rose’s time in Cleveland is ending far sooner than planned. While he was likely hoping for a better outcome, he’s instead given the Cavs plenty of evidence this experiment just isn’t worth their time.